Mobile apps have provided consumers with a magical power to surf the internet at their fingertips while they are on the go. And, these apps have become an integral part of the vast retail industry. Without a doubt, this industry is one of the biggest and most dynamic one in the marketplace. Also, the retail sector has been completely revolutionized because of advanced technologies such as mobile apps. But what makes these retail mobile apps much more convenient is their Point-of-Sale (POS) system which allows small retail entrepreneurs to accept payments, manage inventory, and handle businesses efficiently. The iPad POS mobile apps created by top app development companies are becoming increasingly popular, but what’s the reason behind this? Let’s explore it in detail. What Are iPad POS Mobile Apps? A POS system lets a retailer sell products to their consumers easily. Earlier, there were several components requires for a successful implementation of a POS system such as cash register, display screen, receipt printer, barcode scanner, etc. But a comprehensive POS app transforms your iPad or tablet into a device that can record all transactions automatically and email paperless receipts. These apps are a cost-efficient alternative for small retail entrepreneurs that spare them from spending several hours in managing inventories and placing orders. What Are The Top Five Benefits Of iPad POS Apps For Small Retail Entrepreneurs? In this section, we will look at the top five benefits of iPad POS apps for small retail entrepreneurs. Let’s explore these benefits one at a time. The mobile apps that are blessed with POS systems are designed specifically to perform seamlessly with multiple devices. Apparently, because of this fact, you get more flexibility in your technology choices. For instance, if you have a PC set up at your store, but you are in love with a tablet’s overall look and intuitive functionality, then also you can integrate your tablet or iPad POS system combined with your store’s IT infrastructure in a hassle-free manner. Harbortouch Checkout is one of the most significant examples for allowing seamless third-party integrations to elevate the features and functions of the overall system. It is considered to be a flexible and ultra-advanced POS software for letting small retail entrepreneurs manage their businesses in-store efficiently. Efficient customer service is one of the essential yardsticks to measure the success of a retail business. With the help of an iPad POS app, this task becomes much more accessible. You can make the shopping experience amazing for loyal customers by using these apps to create their personalized profiles, include purchase history, contact details, and custom notes. Also, a web-based iPad POS system can be used to streamline the front end of your retail store. Also, it can be utilized to let employees move with customers throughout the store. The sales representative can carry a tablet with him which has an iPad POS system and answer to all the queries of the customers instantly – this allows you to provide the customers with what they want quickly without wasting their precious time. Harbortouch Echo is a tablet-based small business POS software which is slick and streamlined. With the help of placing orders intuitively and facilitating a seamless payment flow, this POS system lets retailers manage their customers and business efficiently. Even in the best situations, you might lose internet connectivity, but it should not serve as an excuse for discontinuing sales. One of the unique features of these iPad POS apps is that they allow you to sell your products even if you’ve lost your Internet connection. Once you are back online, the app will sync all the data to the cloud and revise your inventory and financial totals. 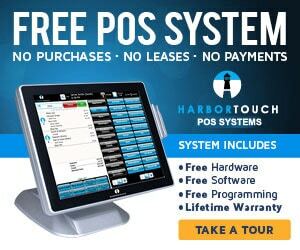 One of the most popular Android POS systems is Harbortouch specifically built for small to midsized retail stores, cafes, and restaurants. This app allows retailers to keep selling continuously even in the offline mode. The retail business is incredibly unpredictable; these stores can gradually scale up with time. But the real challenge for budding retailers is to afford the high cost for setting up infrastructure in a new location. This problem can be addressed with a cloud-based iPad POS software. The cost for setting up these apps is considerably lower in comparison to the traditional units. Also, these apps allow retailers to plan their expansion correctly by providing them with excellent scalability. It’s effortless for such apps to integrate data from new stores once they are included in the system. iPad and Android POS software can provide retailers with higher scalability and the potential to evolve with their brands. It is an ideal solution for efficient inventory management, customer support, and comes with plugins for marketing and sales, etc. The majority of iPad POS apps are blessed with comprehensive and robust reporting packages that help in tracking real-time sales data. Earlier, entrepreneurs have to put a lot of effort into analyzing spreadsheets and Excel graphs for monitoring their total sales. Along with tracking sales, these apps have an intuitive interface that allows you to filter transactions by date, product id, customer, etc. Also, they provide you with useful strategies to increase your sales by cautiously drilling out into the data so that to get an idea of what’s selling and what’s not. One of the most popular examples of this kind of POS apps for restaurants is Harbortouch Bar and Restaurant POS that runs on the Android platform specifically designed to cater to the bar and restaurant industry. This app makes it much easier to analyze the sales data and to let entrepreneurs alter strategies accordingly. These are the top five ways in which iPad POS and even Android apps can allow small retail entrepreneurs to make their business highly scalable, tailored as well as responsive to suit specific customer needs, and coming up with research-based business predictions.